Online coupon codes offer consumers a chance to save money on their online purchases, just as paper coupons do inside traditional stores. Marketers can use coupon codes for re-targeting strategies, to reward loyal customers, and encourage repeat buyers! Click the "Coupons" icon to the left in your admin panel, then click the "Create Coupon" button. You are not able to use non alphanumeric symbols when creating your coupon code, the following symbols are allowed: A-Z, 0-9, "_" & "-". Name your Coupon: to remind you of why/where you'll be using it. 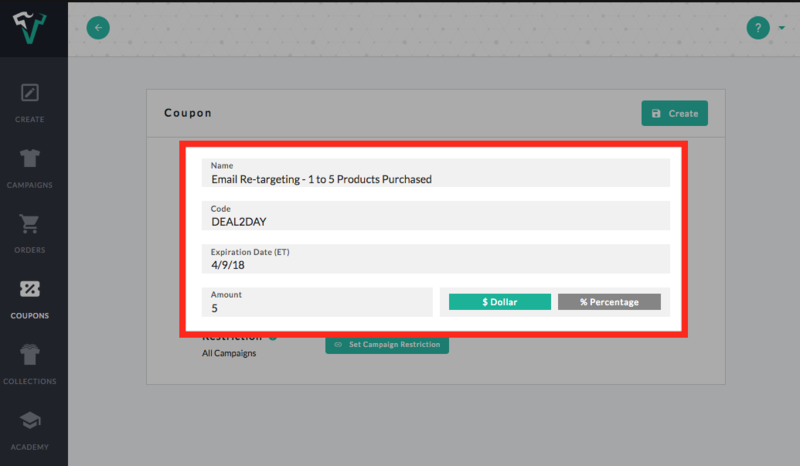 Here you can see that I've named the coupon "Email Re-targeting - 1 to 5 Products Purchased", because I intend on using this coupon in an email marketing campaign for customers that have purchased 5 products or less. Codes are Case-Sensitive: so be sure you are sharing the exact code you've created. I've used code "DEAL2DAY", so I'll need to make sure that I share this code in all caps. Set an Expiration Date: to create a sense of urgency for your customers to use the code and BUY NOW! Today is 4/5, so I'll set the coupons expiration to 4/9 so my customers have the entire weekend to use it. After the expiration date has passed, the coupon code will be disabled automatically for easy maintenance. Set the Amount: which can be offered as USD or as a percentage. I've set my discount amount to $5.00USD, because the maximum dollar amount allowed for coupon codes is $5.00USD. Set the Restriction: to determine which campaigns your customers can use this specific code for. Click the "Set Campaign Restriction" button, choose "All Campaigns" or click a specific campaign, which can then be confirmed under the "Restriction ?" field. 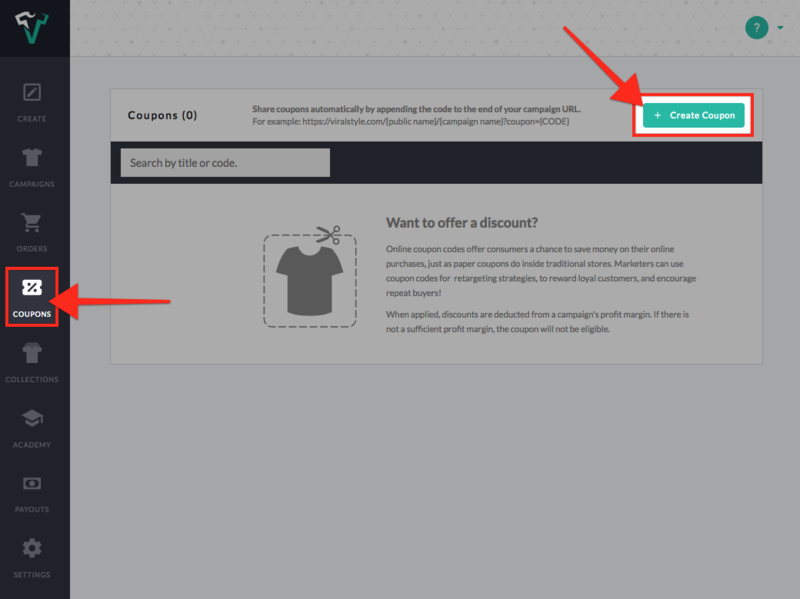 Share coupons automatically by appending the code to the end of your campaign URL using "coupon=code". The URL for the campaign will look something like this, before applying the code: https://viralstyle.com/publicname/campaignname? The coupon code is "TODAYSDEAL".